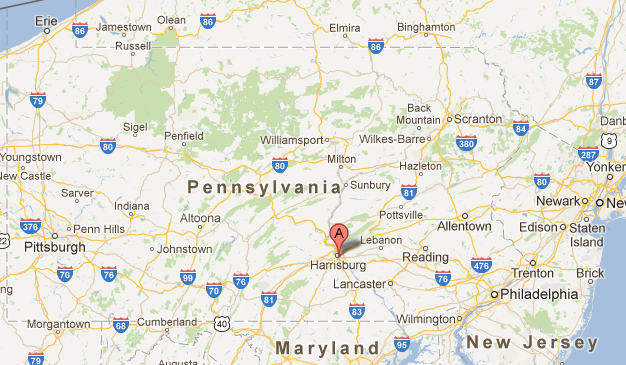 Harrisburg lies in the South Central section of Pennsylvania. It has easy access from Interstates 78, 81, 83, 283, and the Pennsylvania Turnpike (I-76). If traveling I-83 South: Take Exit 43 to Second Street. Go three blocks to Market Square. Turn right at the Hilton Hotel onto Market Street. Go ½ block and turn left onto Court Street (very narrow, one lane) behind the Hotel. Proceed one block into the Walnut Street parking garage. If traveling I-83 North: Proceed across the Susquehanna River Bridge and take the Second Street Exit approximately 3/4 of the way across the bridge. Continue through the S curve and bear left onto Second Street. Go three blocks and turn right at the Hilton Hotel onto Market Street. Go ½ block and turn left onto Court Street (very narrow, one lane) behind the Hotel. Proceed one block into the Walnut Street parking garage. If traveling I-81: take Exit 66 to Front Street South. Continue on Front Street South for approximately 3.5 miles and turn left onto Locust Street. The parking garage will be on the left near the end of the 2nd block. If traveling 11/15 South from the Sellingsgrove area: take Route 322 East across the Clarks Ferry Bridge. South of Dauphin, take the Linglestown Exit and turn right onto Linglestown Road (Route 39). Go toward the river and turn left onto Front Street traveling South. Continue on Front Street for approximately 3.5 miles and turn left onto Locust Street. The parking garage will be on the left near the end of the 2nd block. If traveling 11/15 North - Take Route 581 East (Capital Beltway) near Camp Hill. After approximately 2 miles Route 581 turns into I-83 North. Take the Second Street Exit from the river bridge about 3/4 of the way across the bridge. Continue through the S curve and bear left onto Second Street. Continue a few more blocks to Market Square and turn right at the Hilton Hotel onto Market Street. Go ½ block and turn left onto Court Street (very narrow, one lane) behind the Hotel. Proceed one block into the Walnut Street parking garage. If traveling the Turnpike - Take Exit 19, Harrisburg East. Follow the signs for Route 283 North and then to I-83 South (approximately 1.5 miles). Continue on I-83 South for approximately 5 miles and take Exit 43 to Second Street. Go three blocks to Market Square and turn right onto Market Street. Go ½ block and turn left onto Court Street (very narrow, one lane) behind the Hotel. Proceed one block into the Walnut Street parking garage. 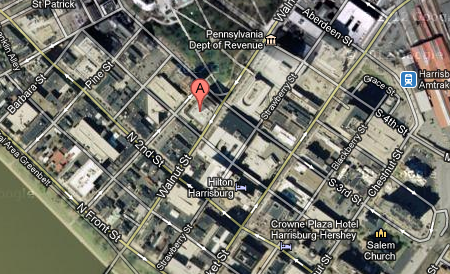 To generate directions to the Harrisburg Federal Building and U.S. Courthouse via Google Maps (click Get Directions and enter your starting address in the address box, then click the blue Get Directions button ). The garages listed below are recommended. 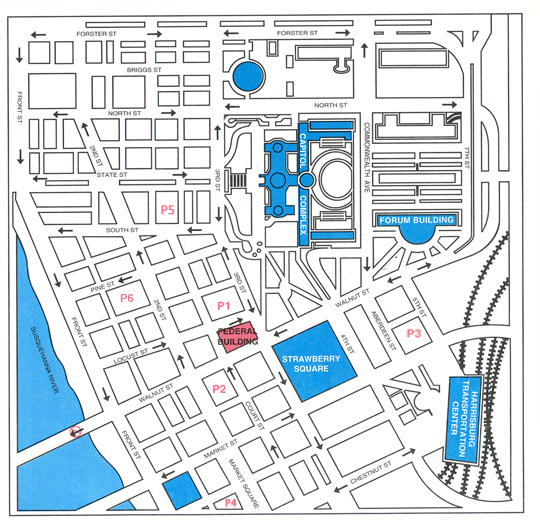 Additional open-air parking is available on Locust Street, between 2nd & 3rd Streets, and at 3rd & Cranberry Street. You must pay the parking fee at these lots, however, you will be reimbursed for any out of pocket expenses for these and other parking areas not listed above. Please present your parking receipt to the Jury Clerk.